universal conflicts connecting events. Presentation exposing and/or recalling universal knowledge connecting prophesy with physics, physical and spiritual. A time of testing and challenges, interaction between the physical and spiritual realms, combines with life conditions working towards a finally. A time when not even tomorrow is not sure what dawn will bring, a time within scenes of turmoil, violence, loss, death, via killing by any means and massive destruction. People battling for survival only one will live and one with die type of conflicts. This becomes the time when one is not afraid to die for all the right reasons and none of the wrong reasons. However, none of the wrong reasons depends on one’s personality, and personal believe system, combined with universal consciousness, except who can say what that is until . . . final battle concluded. acceptance of the challenges and mental projection of desired outcome, broadcasting the most sacred and desired outcome. Regardless, one cannot project, nor consider hopelessness, feelings of despair, nor being out numbered, nor entertain thoughts of dying because you allow death to have control and those around you, too. In truth, ones way of thinking, behavior patterns, daily and conditional programming requires one confronted and dealing with, in positive personal manners: you control them they do not control you. Sometimes, one can shift the outcomes of life and death conditions in less than a flash. a sacred way, with sacred abilities, filled with spiritual concerns to protect, save, and teach humanity void of selfish concerns. Selfless verses Selfish one empowers and strengthens while the other weakens and robs ones of life force energies. Contrast events and movie: A time when love confronted hate, friendship enriched courage and determination, each side for a time appeared matched in their resolve; however, the dark side of negative follows more out of hatred and fear. Which is not always the same thing when with spiritual love, they have more spiritual and internal power and strength to call upon. Written in fantasy or taken from the reality within sacred universal physics and truths. Those who act in hatred become the rabid creature attacking everything and everyone around him/her, has been a theme throughout history. Thought provoking to observe the various ways science fiction along with fantasy movies, parallel humanities, life, on many levels of physical and spiritual interaction, while each are a combined reflection of universal history. Watching the theater screen, the guardians presented condensed flashes connecting lessons learned, knowledge understood, and valuable new concepts, suggesting personal review of, inner-personal skills, with spiritual powers. Comparing: (sacred to lethal), (peaceful actions to violent) and the development of courage when confronted by and confronting, what many might consider the greatest evil in centuries. The one who mislead, deceived, enslaved, killed and destroyed multitudes of people, down through eons and the choreographer of the greatest battles humanity fought and have yet to fight, again. you. The same as he is finished with humanity. Visitation Questions when life spiritual connections deliver surprises in many parts with each section seeking to hear your answers and replies. Some of you I queried about this presentation, and the well, after the first replies I gave the rest of the unique and unexpected presentation amazing and visitation. After your first replies, and you go through it again I would love to hear your second opinions now after having time to think about the complexity of the event. Before I go any farther, this has become a good training tool and teaching at the same time, we all become lack from time to time; however, what is before us we need to sharpen our spiritual tools and abilities. I need to explain, I am one that finds it hard to express things in complete Life teachings for me has proven strong teachers of life lessons and quests. Question 1: What would you do if you received a sacred Medicine Shield, along with a quiver filled with arrows and a beautiful bow, with white eagle feathers? Then two individual spiritual warriors, walk-in carrying a sacred lance and the other a spear, following the ones sacred messengers carrying the medicine shield, quiver with arrows and bow. The lance and spear carried individually by the sacred spiritual warriors, stood against the wall, one behind the he who carried the medicine shield, and one behind the one who carried the quivers with bow and arrows. When I asked this question, everyone said he/she would bless it, and/or leave it outside for purification and receive blessings; and then hang it on the wall. What I received I could neither be hung on a wall nor left outside. Unless I wanted to leave me outside or hang me on the wall, then maybe . . . but. Most forgot to ask what it really meant, where it actually came from, and what reason did I receive from those that delivered said items, to Red Sun. Okay the Elders taught me the importance of combining spiritual physics investigator with seeking answer on all levels. It is critical to analysis, and seek answers combined with possiblities and explanation, since such an items are both spiritual, universal, and physical in most cases. Okay, so maybe my teachings, came from master task masters, never take anything for face value, most things have many deeper meanings when dealing with the spiritual realm. Yes, one needs to research and not take things at face value, not even from me. Yes, the arrival of the medicine bundles and items could not have surprised me and cased me to ask countless questions. However, what it did surprise me “NO ONE” asked or attempted to analysis its meaning or the meaning and purpose of the gift involved with these items. Question 2: Why no one asked the direct question of where and why or how these sacred gifts came from and/or who decided to gift you, Red Sun, with these medicine items. and on the shield or questioned where this shield came from, without me providing leading statements. Question 4: To begin with, no one asked the simple questions of how, who, where and when did it arrive nor what was on the shield? Interesting how they all assumed the shield and all that came with it were material items, first with spiritual meaning and purpose second. People that know anything about Red Sun should know nothing happens in normal ways. Wow factors to unexpected … if and/or … what happened … how … why scenarios in unusual ways are how things seem to happen in my life. Clue to analyzing and asking questions: Conditions in my life, has always come spiritual first and then maybe material or physical, which continuously come in combination with new, unique and advanced spiritual training and journeys. Each item and or gift fit into a series of conditions in relationship to past, present, and future events. I was hoping for someone to asked rhe question who brought it and where did it come from, but instead I had to prime the pump, so to speak. Even when my mother went into labor, rain came down heavy, and with each of her contractions lighting and thunder. Then it rained so hard, the floodwaters, prevented the mid-wife from getting to my mother, and drove several families, wildlife, livestock, and mother to the upper barn, where I was born, and only then the lightning and thunder stopped and with the coming of dawn, a triple rainbow shined across the sky. Important Lesson to learn … when we have others come and ask questions about items received or visions they have received we have to realize they will never give us all the details up front. This means we need to ask a number of questions touching on many levels before we can give serious answers and connect on the correct level, and then look at these things in a more objective and spiritual manner connected with traditional and spiritual knowledge. Besides, we have to make sure we know what level a person in on so we can communicate with them on levels and in ways, they will understand. Now I have given you a little look at any my way of testing and challenging, which this event was more than just a presentation of an event, but away of beginning a new way of working together. We are all spiritual leaders and teachers and have many skills we need to hone, and develop further. Yes, just because it was a friend speaking, everyone perceived it a great gift; nevertheless, all but one forgot to look deeper and question the visitation, or looking deeper into all the details about sacred medicine power and the presentation? . . . A gift, which equated into both appointment and assignment, and no matter what, it is important for us, for when spiritual leaders come together, they also bring their spiritual power and medicines together. In truth, we are all sharing that which makes us spiritual and that which contributes to the sacred circle. In truth spiritual elders need to look deeper into the spiritual meaning and purpose regarding such spiritual presentation/gifts, visits and visitations. We need to be investigators, profilers, and communicators with the sacred ones. In much, the same way we need to analysis, and mediate on matters connected to visions, dreams, and these events, which direct and influence life and conditions. Okay, I know I do not offer a lot of information, but I did it to see who was ready to ask questions and take time to reach out, touch, and experience spiritual experiences regarding events and conditions. Did anyone have any suspicion it could have been more on the spiritual level than on the physical level, before I stated certain facts? sacred medicine shield and other items that belong with the sacred medicine . .
something one can take nor claim nor passed on, it has never been or will be something to trade or exchange. The sacred gifts and powers are given and passed on only after approval from the Sacred Ones, the Great Spirit, Council of Chiefs and Elders, the Sacred Mothers and Grandmothers of the People’s. Nevertheless, the final decision and confirmation the Sacred Father, Great Spirit, and the Highest of High Council of Sacred Chiefs, confirm and approve before we can transport these sacred spiritual medicine powers and to their new guardian. Beyond dreams or imagination, I never imagined this displaced child, Red Sun, a child without knowledge of my biological mother, would be the recipient of any such bundle along with sacred gifts from the ancient wisdom-keepers. The ancients who have taught our people the ancient secrets and sacred traditional knowledge. True I am a child of the First Nation of Indigenous Natives, but in the eyes of the people I am without acknowledge paper connection to any cultural, nation, tribe, or any sacred traditional clan. This then pursues the answer to the question why have I received these spiritual items. Timeline of unique connections for what became a rapidly developing journey: Filled with a unique series of events, yes, a few I have already touched on. One: this arrived a few years after I crossed over and stood in the Sacred Fire of the Highest of the Most High the Sacred Father, and before the Great Spirit. Two: More than a dozen times, I received summonses to attend meetings in the Great Council Chamber with the most Honored of Sacred Chiefs and Elders. This chamber is where the most sacred of honored chiefs, spiritual warriors, medicine elders, and honored leaders of the people from all indigenous/aboriginal tribes and nations, gather to work on matters confronting all who are here. To me it was interesting to speak with the ones who had proven their lives in the service of their people. What a surprise to discover among the Sacred Ones, many hhonored Sacred Mothers of the Peoples among the decision makers and their voices were equal and sometimes more respected. Then, nothing should have surprised me after my sacred union ceremony to SunHawk by the Sacred Father, but this was no less humbling. Fact Two: This and other connecting events came after the Sacred Union Ceremony, which happened a decade prior to entering the private sacred chamber of the Sacred Father and the Sacred Garments of one chosen Sacred Mother of the People. This is when I understood in more detail my prime directive and primary objectives from the Holiest Sacred Father of Sacred Light and Life Eternal: [Save the Children for without you thousands will be lost, thousands more will perish needlessly and thousands more will be lost for all eternity.] Regardless, I have never known such sacred gifts to come without tests, challenges, and tons of lessons: rocks, paper, scissors, everything has many different sides, the yang/yen lessons, and challenges. Truth, when it comes to major lessons and insights, by the Sacred Ones, I have learned it is their way to present countless instructions of what they want with many journeys before one understands their reasons. Part of the journey I learned about included countless events and conditions, along with two dozen lessons to recognize and battle the demonic demons and dark ones. Important to determine the various aims and desires to destroy our people, nations, cultures, nationalities, and subjugate people into two classes the wealthy and their slaves. Then the wealthy I speak of are demonic and ones that serve the Dark Lord. skull ever preserved on this island. I followed the visions and gave them instruction where to find the skull I was given permission to have the skull. I brought the skull home placed it in the shower to remove the dirt and the skull instantly displayed the sacred symbols and colors of the four directions, which many witnessed for the first couples week after I returned home from the private chambers . . . . Fact Three: Certain other events that occurred prior to the sacred presentation: For a couple of years I had been praying for the Sacred Father to heal SunHawk. Open-heart surgery was still very new, with a lot of uncertainties. One early dawn, one Sacred Great Horn Owl paid me a visit. One I had only seen once prior and not since . . . . This Sacred Great Horn Owl stood at the foot of our between SunHawk and Red Sun. She wore a fabulous breastplate of silver and gold feathers, reflecting a full spectrum of colors. Each jewel embedded radiates eternal light, each jewel a full-recorded history of spiritual knowledge and energy. The only time she appears is to announce a period of strong challenges and survival tests. This is important if SunHawk survives what is ahead for us. This meant I would have to willing accept the Great Spirit’s universal challenge, without fear. Around dawn, the Sacred Father, summons Red sun to join him on the clouds: Red Sun, we cannot heal him, by the sacred hand of healing and move the clots; it would explode his heart, and kill him. We were the ones who taught the medical profession the techniques of saving lives, and heart surgery. SunHawk’s only chance for survival equals open-heart surgery, if you can accept and handle the challenges ahead. Remember the following: This that I can do you can do and even greater . . . . These words referred to medicine, technology, and spiritual connections with universal physics and quantum physics. I told SunHawk when he woke-up. SunHawk had an appointment around 1500 hours, and convinced the doctor he was worse off than his medical exam revealed, the doctor scheduled him for an exam to see if he had blocked blood vessels. When he got out of the exam, he had hiccups, and less than a seven days to live. After I managed to stop SunHawk’s hiccups, he has less than seven hours, before death, and surgery scheduled, two-sacred messengers carried me before the Highest of High Councils and the Sacred Chiefs, and Great Spirit, it seems I had been selfish, in my prayers. Yes, it appeared all-of-the-spiritual-realm from guardians, chiefs, angels, and warriors stood in attendance with Geronimo was my counselor. Yes, I have published much of this event online, regarding selfish prayers, and what happened that night save more lives than just SunHawk’s and StillsWater, was the price I would have to pay, if I failed to design an acceptable prayer, which would keep SunHawk without directly including him in said prayer. This trial held in its outcome the lives of many and our futures, but one of the reasons I received what I did. In the darkest of hours, one very bright light shined. Now came the time to learn the secret of the sacred powers, soon given me, so from this trial I was soon to realize, the sacred ways and lessons of gifts, they had been deciding; which one who was to gain the sacred medicine powers and symbols. They would soon have to decide on who would receive such sacred powers. Not too long, maybe six weeks after SunHawk, survived I received visions about a sacred buffalo skull, for several days, followed by several summonses from the Sacred Ones to join them on the clouds. They took me to Catalina and revealed a buffalo skull they prepared for me, and only me. It was a sacred white buffalo skull they prepared for me since my birth, a skull no one else will they allow to receive it or its sacred power. Yet, to get the skull, they showed me it would take a series of phone calls, and why it is important not to get discouraged, since it will take a couple of months and more than four-dozen phone calls. Uniquely, unusual they provided names of certain people in the chain of command, and information to tell the various departments, to insure they listened and realized the skull is mine. In truth, no one on the island could find the skull, until I received permission to obtain the skull if he/she could find the skull. Vision strengthened and exact instructions, directions and details, received about taking them to the area where the skull laid hidden and they had to hunt. Back to saving the lives of SunHawk, StillsWater and countless others, before the skull. Truth, prayers, and blessings one should design for help the many and not for the few or personal oneness of family or friend. The summons to the Highest of High Council of Archangel Chiefs taught me a very good lesson in responsibility, duties, respect of power and consequences. They exposed a few of the negative side effect, selfish prayers can become including dangerous, deadly, and damaging, because one creates a ripple effect and lives numerous lives can and will be lost, beyond what we perceive, if not handled correctly. Prior to the arrival of the shield, the Sacred Ones required their wisdom be understood, because people must realize it is the Sacred Ones desire people learn to see and understand the consequences, and what could and/or would have happened, if I failed to do what they of me and change my sacred prayers . . . . I would not enjoy the consequences. Meaning true prayers are not selfish, and more productive when designed and aimed in a direction where one prays for a few, especially by those the Sacred Ones assign to care for the masses. We must analysis and determine ways to pray that can benefit many and/or masses. Whenever we seek help for our loved ones, we must consider our responsibility for the sacred spiritual universal, stability, and life development. Daily there is a great deal, we need to learn, including how to handle prayers that offer help and guidance for countless, raise the vibration of Our Sacred Mother and beyond. Truth, we need to examine, if I had not structured my prayer in a sacred way that helped the masses, without directly involving SunHawk. The wrong wording and decision would have left me with SunHawk dead, StillsWater dead, and at least 150 or more lives lost and many more left suffering, but then what would have been the ripple effect of lives lost and what would have happened to the community, too, over the twenty years. Truth, I would have been a brokenhearted widow and lonesome mother. Of course, the answer did not come until StillsWater, recovered in the ER after they could not find a heartbeat when she toppled over off the bed and landed face first on the floor, waiting SunHawk’s room for him to go into surgery. Very tense thirty-minutes, many recoveries began with this and more textbook surgeries after SunHawk’s textbook surgery for a total of 60 days; this covered anyone that entered the hospital the last 15 days, and for all who enter the area hospitals for the next 45 days. Even those that entered the hospital DOA recovered and lived. In November, before Thanksgiving I put on an honoring feed, two days after, I got baptized to give thanks for SunHawk and StillsWater being allowed to stay for here for a while longer, although they explained they could only give SunHawk eight years, since he would be assassinated, they even showed me the face of his assassin. All of this came the same night, we returned from San Bernardino, after I got baptized to give thanks for the lives of family. After receiving a massive spiritual indigenous visitation, from his relations, the Sacred Father summonsed me to sit by the Sacred Eternal Flame, with him. Daughter I thank you for your love and offering me your honor by baptism in my name, in the Church of those from Europe, but you are not white. You are one of my sacred children of the Sacred Red Nation. The children of the Red Nations need you to help them. You are to go back and follow the Sacred Ways of the Red Nations and follow the ways I/we have taught you, to help my sacred children, you are to walk the Red Path. You are more than 90% red for that which is not seen, matters not, for it holds no influence or power over you. The blood quantum, influences not your sacred spirit, your spirit has always belonged to the Sacred Spirit of the Red Nation. Without you, thousands will be lost and thousands more will perish needlessly. sunlight, half-on and half off the couch, once grandfather, and grandmother departed. I hear a knock at the entrance door on the second floor. I shouted out I am coming since I knew I knocked the door, but before I headed down the stairs, I looked out the window to see who was at the door, but saw no one. Now, I came out of the trance confused, because I heard what I assumed a someone knocking at the door. However, I had locked the enter door because of being upstairs for a while, more out of habit than anything else. Someone wanted my attention, thus I shouted just a minute I am coming. You see these sacred medicine items we bring here this today, they are for you and only you. Know this a male placed his hands on this shield and tried to claim its power, we one and all have rejected him. This person will sell the people out for his own personal profit and power. His greed will mislead the people in a direction that will be destructive for thousands. The Sacred Father, the Sacred Mothers of the People, the Highest of Highest Council of Chiefs, and the High Council along the Great Spirit and those who watch over the people from the Sacred Village, have all chosen you. You have proven you do not take your gifts as power and position but you see them for what they are duty and responsibilities to the people. As you have seen for far too long, since the invasions, many of the Sacred People lost their way, and they too began to see title as power and position as something for personal gain and profit. Even our people have lost their way and they are not doing things for the good of the whole but for the good of a few. One must make the decision for the good of the whole and not for the good and profit of a few. True the decisions for the good of the whole may not in all ways be popular, but make sure the outcome will benefit the many and not the few. Remember you belong and part of the red nation you are not white, this shield and the medicine items we give you today are more than symbolic they are the sacred medicine power embedded in these items. Across time and journeys you will need to add your personal totems and sacred wisdom to this medicine shield, however, the sacred wing feathers of the most honored and Sacred Eagles and Hawks will remain and journey with you, too. I received visions and impression of the pain the one who proclaimed himself the Sacred Medicine Man with all the sacred powers, he assumed were his and the misery he will bring to the people. Great suffering will befall the lands and the people. Remember, what we deliver here today means duty and responsibility to the people. He may have the shield hanging on his wall but it is only a shell of what the sacred reality and truths. Once they completed the ceremony, connection, presentations, and visions, the shield, quiver with arrows, and the bow, moved towards me and we became one in sacred unity and I received the medicine power and responsibilites. Nevertheless, the two-sacred medicine warriors carrying the lance and spear, moved forward and stood beside me and remind by my side to this day. The stairway is just inside the house by the entrance door, which leads from the upstairs to the door and the second floor. About halfway down the stairs I received orders to sit during the presentation, and there I remained sitting where they instructed me to sit and remain, during the entire presentation and ceremony. Interesting how the veil incorporated the stairs into part of the Sacred Chambers of Chiefs and Elders, and the desk beside the stairs, they place a teaching holograph. They showed me that the medicine of the bundle is a very sacred responsibility, to respect and honor the people, to make sure the decisions I make benefit the whole and not a few. They showed me, what several things which has harmed the people on the reservations and others across the nations. Far too long tribal elders have been making decision that benefit and profit a few, and their families, which have harmed the many. For the healing benefit of the people the decision must benefit the whole not the few. Granted not everyone will be happy with the decisions, for they have been use to the games. You cannot please everyone all the time, but you can improve the health of the nations and lands if you make decisions that benefit the masses, which they revealed sacred truths and insight; which showed what is and has been and needs to happen. All this took place during the sacred visitation. Okay, now I ask does anyone have any questions and/or comments. The one of several important things I can say … This changed my life and enriched it at the same time. What would this mean to you and how do you think you would handle it.??? Awareness of a life journey is a gift and talent I always knew was a given, long before I could walk or read. Guardians impressed on me, writing is one very powerful, and important tool in my life and something I would have to do to help the children. Interesting, how my first writings got me expelled from sixth grade before earning and Honorary PhD in Psychology and a minor in Physics from UCLA. Okay, in sixth grade; the teacher graded my report with FOUR very large FAIL, and the following reasons: (1) FAIL = theft of intellectual property; (2) FAIL = for plagiarism and copying intellectual property; (3) FAIL = trying to pass someone else’s work off as your own, and (4) FAIL = Indians are too stupid to create such superior research. Too Stupid . . . I am too stupid to do quality work . . . this is not my research? How dare you assume I was a theft; which when and why I challenged him, he had me expelled. doctorate from a professor’s trunk. Why he was convinced he clarified by saying my report was one excellent superb doctorate, which earned this f highly intelligent scholar, top honors, along with his PhD and professorship. Without missing a beat he turns and looks straight at me and shouted: Look you stupid girl where did you get this doctorate and who did you steal it from, I would love to meet and study under this professor? Arrogant child speaks out: Gee, thanks. Now what can this professor tell you, you see I am the one you call professor standing before you SIR? This is all my research, this that you call intellectual masterpiece belongs to my five years of research, and training. All of what you admire, I put it all together for this local Science Fair, considering I could not think of anything else for the fair. The only help I received when drafting up the report, Glen Hunter make me an outline of the style and form required for professional presentation, and I did the rest. Currently scientists claimed we only used ten-percent of our brain; which I realized at five years of age was an untruth. Now you have the arrogance to expel me for your arrogances. Five years of gathering information, created a five-hundred page doctorate; and expulsion from sixth grade. received an Honorary PhD in Psychology and minor in Physics along with offer for a full scholarship to UCLA, after junior high school, but life . . .
combined with what can be done to improve health, in addition to researching what are the variables in the same family environments that can cause and create environmental influences on a persons and families health. to know the harm and damage telepathic energies can create and produce. level of communications and energy influences, since all condition can influence all of us in one way or another. Energies and thought-forms create different positive and negative degrees of programming: Energy patterns, lights without impurities, brilliant colors, crystal flakes of transparencies are positive verses negative energy of hostilities, lights with darkness and shadows, impure flakes bringing pain and deception, colors with impurities and lights lost in confusion on individual’s psychological and physiological environments. Certain energies and thought-forms can in some instances activate dangerous environments on all aspect of individual physiological, mental, and emotional via subconscious programming, on a person’s physical, emotional and uncertain lifestyles, which might take years for one to recognize what became the impart on one’s life. overeat, while it causes another to develop cancer, lung, and kidney problems too, in addition a wide variety of other problems. Many problems react to subliminal communications more rapidly under hostile conditions, especially, when one is not fully aware one is sensitive to telepathic communications on subliminal levels. Very serious problems can occur when one lacks the knowledge they can receive various forms of psychic transmission or they are a transceiver using numerous levels of conscious and subconscious communications equals serious to extreme danger. spiritually with the universe. Intellectual Truth: dyslexic peoples are just the opposite they are highly intelligent with the ability to connect with the universal consciousness. Most test out with high IQ’s and strong awareness and the only thing about dyslexic persons, we think and see in pictures and not words and we can create and assembly larger details with our minds that those that think in words and numbers only. Quantum Physics, not from the establishment of white institutions of higher education, but from centuries of ancient wisdom and knowledge, taught from the ones who maintain the sacred wisdom and ancient truths. It seems many Indigenous children are dyslexic; the word dyslexic is another work for thinking outside the box aka Einstein Syndrome. We have the ability to see beyond the four walls of society and accomplish even greater things. more votes, along with profiting from removal of children. This information I later learned from a couple of Senators, (who want to remain nameless) any children born with light skin MUST BE removed from their family and raised with whites, however many whites were unaware of the child’s background. The families, who slightly knew about the Indigenous Native blood of the children, would normally receive money with the understanding the child would never learn of his/her heritage: reservation, family, or actual birthdate. One strange truth, the new parents to be would sign documents, revealing the biological parents’ name, heritage, and background, true, along with the promise silence, and never to disclose said information, or they would have to pay back all the money, with interest. Everyone signed the original documents package with complete information; however, disclosure of child personal info disappears or never in new caregivers documents package. The signing of documents and receipt of a check concludes the exchange of child after the second promise of silence, thus the new guardians receive a good size check in exchange for silence; or caregivers would suffer consequences. The pain of separation is one of the harshest reasons many children feel so detached and lost in this universe, because our spirits cannot connect the same way as those that want to make us walk in their footsteps. Our eternal spirits remain linked to the universe, in different sacred and spiritual ways that go beyond words. In many ways we have transcended, to higher spiritual levels. The Sacred Eternal Spirits and Souls of Indigenous Children remains linked deeply within the seeds of spiritual culture; which means our eternal oneness remains linked to the sacred universe, which cannot be broken or denied. Each drum beat speaks a universal song that fills our spirits with the sacred spiritual union calling, seeking, and teaching each of us to understand our sacred traditional knowingness that connects us to a sacred universe. We are connected, but without real tribal unison, we do not feel complete, it takes time to know where we stand the Sacred Ones and our Guardians are still with us. They have done everything they can to destroy this bond, but you cannot break a universal bond. The government or the universe cannot take the sacred DNA oneness out of our eternal spirit, they cannot tell the Sacred Father, Ancient Ones, our ancestors, and all our relations to walk away and deny us. They have no power of influence to dominate the Sacred Spiritual Universe and Spirit World, nor control over the universe, which is how deep our connection goes. Know the Sacred Ones neither deny nor reject any of the children lost, or divided; time to call out to all our ancestors, and relations, let them know you want their help to rejoin with your relations. Then ask them to guide, support and teach you to reawaken your eternal spirit and life, one of the many reasons the Sacred Ones sent me here and I write. Even though events removed me from my relations, this the Sacred Ones foresaw events and sent Grandmother M, so I could experience, absorb, connect with and comprehend the spiritual universe in a more spiritual manner, thus the Sacred Ones walked with me to help me see and comprehend our universal connections. All of my life has been a sacred spiritual journey, to help save the children and help those that seek to understand the Sacred Spiritual Universal Truths and realize the Sacred Ones have not forsaken any one of his children. It is hard to say how many visions and the amount of guidance I have received since I was too young speak, to read, or write, telling me I needed to travel this life journey, for without Red Sun thousands of lives will be lost and thousands more will perish needlessly and possibly lost for eternity. All of my writing comes from their guidance, events, visitations, experiences, and sacred journeys across more than sixty years. Their decree must have been very hard and scary on my mother; too, knowing the church had a standing bounty on our heads. Nevertheless, for a time in while in hiding, mother survived, and her child was born; since for a time her sacred protection proved stronger and more powerful than the power and voice of what they perceived they stood in and for . . . the all-powerful church. Many visions and interventions by guardians, Holy Mother, Sacred Father, Mother of the People, Sacred Mother M, and one Jesuit Monk’s with strong convictions against killing of one who has not the power of speech, spiritual guardians were called into play to take carry out their sacred roles, for the survival of mother and child. This became a powerful battle of wills, truths, and realities: protection and survival of a child the Sacred Ones sent, to help his children, in direct conflict with those that proclaimed themselves the voices of God aka Creator and the Sacred White Father, who signed our death warrants. Our death warrant sealed out of fear, misinterpretation, and falsehood: Problems increased with the misinterpreted by one indigenous translator regarding the vision’s and prophesy of elders. Could it have been jealousy, which caused the translator, to wrongly translate the words and information of others regarding the sacred spirit and purpose of the child . . . spiritual revelation? Could it have come out of fear or greed, what did he assume or did he really misstated words and meaning, between revolution and revelations, against the church? Or maybe he had other reasons for what he said; all too often translators were the cause of violence and death, when they held anger against another, the family, clan, or tribe. Translator said: The child would start a revolution against the church and destroy the church. The truth of the vision or prophesy revelation; the child will start a reawakening of spirituality and traditions long-lost or forgotten. The aforementioned information I learned from Grandmother M on the day of, and only a few hours before—her crossing. Revelations awakenings and enlightenments verses Revolution a time of undoing through violence and destruction or start an upheavals against others. Truth it matters not, my life was under spiritual guidance and guardianship of the Sacred Ones: From what the sacred Father revealed to others in visions and ceremonies: Red Sun is here now, because many gave their lives to make sure she survived to help the indigenous native and the all peoples, whose hearts are sincere and come with and open-heart seeking to see and understand. Not just the sacred children who have suffered much, but also all of humanity, who are facing critical times. Red Sun is not the only one the Sacred Ones and the Holiest of Holy Mother chose and sent here to help show the peoples of all nations, cultures, and clans, the purest of sacred traditions, cultures, knowledge and medicine ways . . . Yes, all of the most sacred gifts and abilities of the sacred indigenous people still exist, but too many have become mislead, fearful, confused, corrupted and/or emotions distorted. For this reason, they directed me to share experiences, knowledge, adventures, and journeys to help others see and comprehend the wisdom of traditions in stories, adventures, history, and through enlightenment. Truth, for those who have eyes that cannot see, heart that cannot feel, and a spirit lost, and understand not, heart locked to truth, by the blinded heart of others who teach them to believe, OUR sacred ways are evil or outdated, I pray for you. I pray enlightenment will touch you heart, mind, eyes, and spirit. It is important we become one with the Spiritual Universe again, if we do not, we might be lost forever. Know none of us can force anyone to believe or accept, we can only share our wisdom and traditions, but it is up to whomever, to decide, which avenue he/she will choice to travel. Personal Background: What about my life, heritage, and personal, now that I have some sixty plus year of personal history and adventures? Cherel Michelle Red Sun EagleHawk: a child born of Nez Perce, Assiniboine, and Salish parents into the WhiteBear Clan …Tall Walking Standing (Silver tip) White Bear. Long before words I always sensed, then witnessed one such beautiful sacred white silver tip grizzly bear guarding, and watching over me. Yes, a very tall Sacred White Bear stands with me, too. The one that walks with me is taller than a two story-house. These days my Grandfather of the Sacred WhiteBear, calls to me and walks with me in a sacred way so I can help the Indigenous Peoples along with many other sacred guardians and guides. My heart and spirit stands with the Sacred Ones GUARDIANS, their teachings and guidance. No matter where I travelled, or where others hide me, or the distant from my biological family, it mattered not . . . . The GREAT SPIRIT, SACRED ONES, and GUARDIANS did not ignore me, turn their backs on me, or deny me the sacred truths of my relations. My husband SunHawk was a Standing Bear, and one man, whose council men respected and they sought out. It matter not where we went social gathering, major Pow-Wow, a week-end event, in no time SunHawk disappears. I knew if I wanted to find him the only thing I needed to do, look a large gathering of men, to find SunHawk and a few other highly important elders. The terms CHIEFS of the NATIONS, of the NATIONS, or MOTHER of the NATIONS are not something for one to take lightly, especially when one receives from the Sacred and Highest of the Most High Council of Chiefs, a sacred medicine shield, a quiver filled with arrows, a bow, and two guardians with lance and spear to stand with me. When they arrived I was told the sacred power they deliver to me was determined by the Highest of the Most High Sacred Council of Chiefs and the Great Spirit, I would receive it and not the one who placed his and on the shield and tried to claim its power. It is important to think of what is good for the masses not the glory and profit of the few, when one begins to sell ones souls for personal gain then one is not honoring the sacred ways. Grandmother M, a very powerful medicine woman, and one valued Sacred Spiritual Mother of the People, well-known Wisdom Keeper, and more. From the week, Grandmother M took me in her arm, all who knew her, from clergy, priest, nuns, Chiefs, sacred elders, and lay persons used me to reaffirm to grandmother their respect, perception and love for her, sacred spiritual abilities. Everyone called her a Saint, Sacred Mother M, a miracle worker, and healer, from the way she cooked, to her laying on of hands; which is why countless people all over the world considered her a Sacred Saint. Truth, if she had been Catholic . . . she would have been canonized. It is hard to believe how widely known and loved Grandmother M had been by hundreds’ of thousands on both sides of the USA and across the oceans. One Indigenous Native grew-up in the home of Missionaries, but her spirit was always, traditionally sacred and why all who felt her, sensed her presence, knew very honestly respected the touch of her spirit, heard her voice, or experienced her universal spirit filled with spiritual-love. Indigenous elders and traditionalist always knew universal and spiritual love is extremely powerful healing energies. A very powerful medicine woman, who learned/honored/honed her sacred skills via tutelage of Ojibwa Elders in Nebraska, born in the late 19th Century, years before the Dust Bowl, cause the closer of the reservation and the tribe moved north to relations. From the time she could speak, they assisted, supported, and trained her to hone the skills she was born with, and gifted. Once the Sacred Ones were satisfied with positive life force connecting her sacred spirit eternal light with the ancients and she would use the knowledge and gifts from the ancient in sacred ways. The wisdom keepers taught her the sacred knowledge, powers, and skills of the ancients. Once she advanced to the next stage in her spiritual life journey, her guardians send her out among the people and she became both student/teacher and teacher/student, and she received additional education among the Sioux, Apache, Salish, and Dine. Until she crossed she taught directly and indirectly more than a million people in the Sacred Spiritual way of our people. She was migrate worker, cook, spiritual counselor, medicine woman and missionary. She claimed to use the bible, but it was only a prop, for she taught the sacred ways of our spiritual traditions and used the same to heal. Using the sacred traditional knowledge and medicine ways of the Indigenous Nations, she helped hundreds of thousands find their path, get well, in addition to directly and indirectly bringing improvements in many programs and lifestyles. IN truth, she was the happiest when she was helping others or working with her hands and feet in Mother Earth. Very few spiritual wisdom keepers, every hundred years, around the entire world, who are found pure of spirit-heart, spiritually worthy, who can receive the most Sacred Gifts and Holiest of Blessings. Remember, when one has a pure spirit filled with spiritual love it is easy for the Sacred Ones to express their loves and gifts; think of it as the Sacred Ones has a vessel to directly connect to us in this universe through their most sacred spiritual vessels, who can handle such sacred spiritual energy. Still only three of four will receive sure powerful spiritual blessings of Wisdom Keepers: with the knowledge to handle universal spiritual traditions, medicines, prayers, and the sacred knowledge to work with and handle spiritual physics, including sacred ancients power sources; which the ancients only pass down to the most honorable and sacred of spiritual elders. The Sacred Ones say you must first learn to use the sacred gifts and skills you were born with and wisdom given you to in a sacred manner, and then only if you handle them honorably, will we consider sharing the most sacred and ancient knowledge with those called. As you know those they call and test start at an early age, among those only a few are chosen, and among those chosen, very few receive the sacred blessing of the Ancients and among those fewer still will they empower with their sacred powers and abilities. Grandmother M received a number of visions about a girl child, the Sacred Father and Holy Mother referred by the name of Red Sun. If the child is to survive, they needed her help to rescue and guard the child who returns, to help the people. Visions arrived a few months prior to the pivotal event, which held great importance in hers and Red Sun’s lives. The visions she received combined with flash visions and spiritual communications, proved very straight foreword instruction; revealing the faces of whom to see, who to stay clear of, and whom to speak with, along with who and what was behind the plot. The visions revealed important instruction of what to use and required to trick others into assuming the child was dead. They also gave her a list of supplies required, medicines to gather, time to plan on a place to hide, which they showed her how to find it and possibility of staying hidden with Red Sun for a couple of weeks. Just before she arrived on the reservation, they instructed her who to speak with, what to say, and who she could trust to help rescue the child, Red Sun from death. Yes, the visions unfolded who and what were behind the problems, fears, and selfish-greed, which helped her to know who not to speak with and whom to avoid. In the middle of violence, many breaking in, people shot and some killed, by the decree of the church, and greed, this night she became my grandmother. A new life journey of spiritual awakening, enlightenment, floods of sacred knowledge, spiritual guidance, activates powers, recognitions of sacred consciousness, and spiritual lifestyles, she activated. Once in her arms and removed from danger, our sacred bonding is strengthen and new visions revealed; the Sacred Ones chose her to teach the child, in the sacred ways elders taught her. Our bonding insured a strong, sacred, spiritual connection, which strengthen the abilities between us to perceive conscious/and subconscious and spiritual energies, empowering all the teachings that inspired my foundation. She helped me accept and comprehend, just because one is removed from his/her reservation, taken from relations, the Great Spirit, Sacred Ones, Guardians, Elders and Ancients will neither deny nor fail to teach, those separated, if one is acceptance, willing and open to learning. All too often the lost child make the assumption, if one is not on one’s reservation, one is no longer part of or connected to the sacred oneness of ancestors, along with sacred spiritual guidance, bonding, and knowledge, which I soon realized this is a very big falsehood. Okay, one possible truth, maybe it can be easier to learn living on the reservation, but open up one’s spirit-heart and mind to the Sacred Oneness for amazing things to happen and it will come to you no matter where you walk. All our training, no matter how minor one assumes, of no importance is not true; if one learns in a positive spirit, and learn in a good way, all things one learns will prove its importance in your life and the lives of others. Yes, it requires all of us to learn and understand the truths of helping all our indigenous relations and tribes, not just ourselves or a few. The oneness and sacred indigenous spirit stays, along with our guardians stay with each of us, too. My directive requires me to return to help the people of our sacred nations. Each of us need to ask our self and sacred guardians: What is my prime directive and primary objectives? Grandmother M more than a medicine woman: she was a Sacred Wisdom Keeper, Healer, Guardian, Guide, Grandmother of the Peoples, (which others translated into Sacred Saintly Mother and truly a very Sacred Mother of the Peoples). This sacred mother was my mentor, guardian, protector, and the one that saved me many times from death and on a few occasions brought me back even after I have crossed. I can remember when she completed praying for people, guardians lifted her and she walked inches above the ground for hours afterwards. The sacred powers of a very powerful medicine woman, they wanted to use and/or destroy; and my journey with Grandmother M is among one of numerous reasons, my spirit accept and realized the importance of a writer. Sacred Grandmother M’s daughter was a sociopath and High Goddess of a Neo-Nazi Satanic Cult. Originally introduced in the Neo-Nazi White Supremes Organization and Satanic Cult Goddess, wanted to own Elinora, obtain, and possess not only Elinora’s abilities, but also the abilities of Grandmother M, anyway possible. However, because of Elinora’s behavior and the fact she loved misusing the sacred abilities given Elinora from childhood; meant she failed her early childhood tests and her second chance during her teenage years. By her 13th year, her greed and impure heart lost Elinora, the right to all the sacred knowledge and sacred teachings. After Grandmother M rescued the child, Red Sun, me; Elinora’s jealousy grew, the cult wanted her to take the child in and turn her, after my 13th year, but they did not want her to kill the child. What they wanted was for her to behave loving one minute, abusive the next, along with impersonal and detached. They hope to turn me differently, after I had gained my powers. But there was another more powerful and sacred universe with different plans . . . . Enlightenment, my sacred guardians and the Sacred Ones stepped in and took action. Interesting how each one began and added their influences in numerous ways, but not until the first hour, of the first day, after the rubber of the family’s Chevy or Cadillac (not too sure which one) hit the highway, but they waited until the driver turned the car heading north away from the rural countryside of Riverdale, California, and headed towards our vacation/family reunion destiny in Yellowstone/Teton area. The journey, the pivot point, the life renewed in Yellowstone. Strange conditions rapidly arose; which swiftly impacted (total being of Red Sun a.k.a. Buckeye the human lie detector and child’s earthly spiritual being) and summonsed the total of child/Red Sun inside a vortex . . . . What is this? What is happening to me? Why do I feel strange, my being hurts, many changes? Losing . . . part or all of my being, yes, no, terminated, if not what is this that’s overcomes me? I can hear Glen Hunter and Elinora talking . . . but their words are fuzzy and strange sounding. The words they speak I don’t recognize, they speak a strange language. Disconnected, no relation, man cares woman hates. teaches, awakens, and verify life’s sacred adventures. sacred truths, are valuable energies one cannot embrace just because of the single voice from another, and this is where Mother Earth and Yellowstone the Sacred Heart of Mother Earth, and the Sacred Guardians summons proved valuable. Grandmother M, in conjunction with Mother Earth, the Sacred Ones, Sacred Medicine Elders and spiritual guardians, along with others and their abilities, invoked the Autocatalysis talents from Yellowstone, before life’s journey and directives got too far off course. The Sacred Heart of Mother Earth we call Yellowstone and the Sacred Mother carried us (two-halves) on incredible journeys enriched with living visions and vision quests, all of which they put into play to insure mortal child and eternal Red Sun, become fully aware both; past and present; now and always—indigenous traditional native. The sacred universal time arrived to insure that which became detached, choses to reunite to save lives, for one without the other cannot awaken to realize the importance of purpose. . . .Sent to help people via sacred teacher and guardian, and why the Sacred Ones send Red Sun to help save thousands lives from getting lost along with thousands more perishing needlessly. What a thing for a child not yet four years of age surrounded by awakening visions to; and yes, a child can become very confused quickly and react with denial. No amount of words humans could say, I neither would believe nor could accept. The only question: What type of game are people trying to play, their words make no sense. Nevertheless, acceptance arrived easy with the presentations from Yellowstone within the Sacred Heart of Mother Earth. Beyond words, Yellowstone in many ways can/did generate serious impressions and instilled fantastic enlightenment for the child, whose time had come to awaken, to the reason for her name of Red Sun and her eternal life…. have become acceptant of nor found conditions easy to comprehend, for I would have had too many unanswered questions. Neither do I think nor would I have taken the right direction the Sacred Ones expected me to accomplish, if not for Yellowstone Autocatalytic Influences and our association. Fact, neither spiritual guidance nor visions would hold the same meaning or spiritual energy enlightenment. No matter how spiritually powerful, Sacred Grandmother M had proven herself to everyone that knew her, the things that took place, shortly after the journey to Yellowstone began, and continued until the day Red Sun anew, left Yellowstone, the intensively powerful events, filled with life and energy Grandmother M could not have choreographed or created. No one could take me to the edge, hold my spirit, remove hundreds of thought forms, and lies, while awakening reality and truths. Every fragment of sacred energy wanted to make sure I recognized, appreciated, and accepted I was indigenous native and nothing else, by life was valuable and I was on a very important life journey. Visions strong, communications stronger, and interactions amazing, yes I can say while there I evolved in many ways. experiences in association with the Ancients and Sacred Ones who taught and passed on to our sacred elders, wisdom keepers, chiefs along with ancient sciences and knowledge of universal/quantum physics. Yes, our people knew and lived by many ancients’ secrets and traditions, along with acceptance of our rich heritage via experiences of sacred powers and spiritual psychic abilities, long before aliens invaded our lands. One part of my prime objective Yellowstone allowed me to recognize; traditional past with our present; allowing all too honestly awaken and connect to their sacred future. the Sacred Ones along with our Sacred Father have forsaken our people and denied us access to our universe. Yet, others believe our ways are nothing more than falsehoods and lies. To them the sacredness of the universe is spiritually dead. It is alive, eternal, beautiful, and wonderful, beyond words and reason. Much of my writing takes one on wonderful journeys and adventures; which give you the opportunity to see and comprehend the vastness of our spiritual realm. reservation and taken from their relations, the Great Spirit, Sacred Ones, Guardians, Elders and Ancients neither deny his children nor I Red Sun. People of the Nations need to realize the Sacred Ones never turned their backs on their sacred children, but WE continue to turn our backs in varying degrees. . . . Grandmother M’s teachings became my foundation; combined with her spiritual guidance/gifts each had a very powerful influence on my life. back into the months prior to the gift of crawling or speech. However, I could understand the spoken word and comprehend the thoughts and emotions of two-legged humans, four-legged families, feathered friends, and nature. activities, enhanced perception of thoughts and hearts across a vast universal array of energies. Grandmother M taught me to analysis the way my spirit-heart accepts, visualizes, personal environments via programmed thought-form energies is a very important part of building ones foundation. A child without verbal capability possessed active telepathic communications and strong receptive telepathic awareness with spiritual adults, grandmother, and animals: We all had recognition abilities of individual thoughts, concealed in a mixture of emotions, and energized by a different mixture of verbal speech, which among humans deception on many occasions made things interesting. Considering, their telepathic conscious and sub-conscious thoughts, I perceived louder than verbal words. relations across distance and space, with spiritual abilities and wisdom. It seems I had the same sensitivity, and assumed everyone had the same abilities, what a shock to learn very few could communicate telepathically beyond their physical five senses. Okay, I was eighteen years old when a friend told me I was not the normal, my abilities were extraordinary, which is why I scared people. Energy transmissions, receptions, and extrasensory psychic activities are obvious readable sensory vibrations among animals: domestic, wild, farm animals and some cultures. Sometimes, when the energy fields transmit strong energies in variable direction, the behavior of animals around the family home reacted in ways that signal conditions we have not yet recognized ranging from love to psychic danger or extreme violence coming. Truth, this awareness, receiver, and transceiver of life energies enriched a lifetime of knowledge to numerous forms of universal, spiritual, conscious, and subconscious, life energies, inspired research and hundreds of scientific and spiritual questions within countless lifetimes of ancestors before me. spiritual forms: sounds, lights, colors, energy patterns, vibrations and vibrational waves, besides countless communicative forms in nature’s universal consciousness. Okay, this all might have been in early formulation of some very wonderful life stages, prior to Yellowstone. AT first life said you were three going one twenty, until . . . now you are ageless going on eternity. connection and sacred enlightenment, no human could ever accomplish, is touching ones spirit. with me since the minute of my birth—one very tall, powerful, wonderful, protective, standing, shimmering white, grizzly bear, and other ancestors of the Bear Clan, helps guide and protect a child born in and/or around Montana. Many conditions and events activated Yellowstone a master teacher, who proved in various ways a grand architect at enrichment and development, which awakens one to a powerful consciousness, for spiritual/universal bonding, and expanding knowledge connected to the Sacred Ones and Mother Earth. Strong awareness skills took me on a massive series of human and spiritual adventures combined numerous experiences filled with expansive energy conditions. Yes, Yellowstone proved a very pivotal factor in my life and my universal awareness. centuries these same dynamics influence via enlightenment, awakening, and/or heal or destroy our universal and personal health conditions. energies cause? It soon became obvious how positive interactions among people can lead to happy healthy bodies and lifestyles while negative interactions can influence and lead to, unhealthy lifestyles and various health problems. Our psychic and spiritual awareness for centuries enabled our unique interaction with nature, and nature’s children, translated into spiritual/telepathic communications on different levels, filled with sacred and unique mental connects with thought-forms. interconnected . . . my relations. wisdoms, insight into the Sacred Universe, to understand the vast knowledge and sacred truths, the Sacred Ones revealed to our people they revealed to me and others, too. Time for the people to awaken and accept their sacredness and oneness with the Sacred Universe. *Sometimes TRADITIONS must be broken to make TRADITIONS work, is someone thing they said and imprinted on my mind and spirit, many time. For this reason I write about the sacred gifts, guidance, and enlightenment I have received, all of which traditions says is not to be share, but the Sacred Father and all the Sacred Ones, they say it is important and this is the reason they want all they have shared with me shared with others. Sacred Angel waves his hand the windows close and we journey on into another area where the (Highest of the Highest of Light of Life Eternal) Golden Choir of Sacred Angels’ are not allowed to enter for it would hurt the spirit of the Sacred Universe. The darkness and pain, is too much for them to be touched by, since they are the purist of beginnings. Yet, others within the Sacred Father Universe, the Archangels Realms’ of guardians, guides, teachers, protectors warrior guardians and warrior angels. Then there are the spiritual warrior angels. They have certain abilities that can help others and they are the ones who work on many levels in various areas . . . .
You need to understand a little more before the next phase of your universal experiences. “Yet, out of the great loses, are people forced to awaken, but out of the small ones, too. Maybe now halfway around the world another nation will find resurrection from subjugation, too. Then, maybe, (nothing is for sure,) after that in a short amount of time, all nations will realize they must come together and work together. IF NOT, they will condemn countless nations including their own, lack of love, caring and insight will affect all humanity within this and several more decade: casting the world into darkness in addition the violence will lay to waste lands given to humanity in love by the Sacred Father. What will be instead of life is mass destruction. disciple or prophets who themselves have been misled, for many serve the Devil of their own freewill, but others are deceived into following the Evil’s children. Know a person’s heart and spirit, and you will know the many who see life and the world in colors of selfish greed, darkness, hatred and death, while others see life in colors of love and compassion. life in colors of laziness and who will suffer death onto others for they walk in a sprit filled with selfish pride, fear and hate. They are the ones who give control over to the few who take pleasure in the many ways they can mislead and destroy all of humankind. we hope will supply explanations to the why and what’s important for . . . Hopefully Red Sun you’ll gain the understanding we’ve been sent to guide you though. such pain from entire families and children who lost family members in the World Trade Center?” Even in the sounds of machines pounding, dogs hunting, people shouting, and all the other equipment digging, removing, cutting and searching, it was not hard to sense, experience and feel the pain of too many. Is there anything you can do to help them right this minute? provides you with insight into a few of the causes. Now one can say this is a time of evil unleashed, a time when great darkness of death, pain and destruction has been given the power to be. Life now is the seasons of bad winters leading to the ruination because evil was unleashed and accepted by those who see life in colors of ruination, hate, anger and darkness. Know the hearts, spirits, and attitudes of people will decide the balance. However, akin to the ruination of winter coming the sun will bring, new awakenings, new life, life renewed, as well as, the gift of renewed awareness. If all of humanity is willing to carry humankind into spring: when all of humanity comes together with the determination to find similarities and overcome differences, the sun will over power the darkness. Sounds to me what you’re describing humanity should do is work at life in the way a husband and wife need to work at life: it takes work to make a good relationship, strong marriage, wise friendship and spiritual bond. the Spirit of Christmas is, what they too don’t understand the spirit shines first from within . . . . The Sacred Father has not abandoned anyone. Remember, He Who Is the Light, is the bearer of love, life, lessons and light. He can also be the giver of life anew. Secret: The ruination of humankind walks in the disgust of Religious/Righteous Indignation; watch the lies and be on guard. Deception is tricky until humankind comes together with resolve . . . to overcome their differences rid all conditions that leads to . . . terrorism and repression. Then and only then can it be said, lives lost and blood spilled was not in vain. Strange how some of these things you speak of now Medicine Elders, Spiritual Leaders, Chiefs and many World Leaders have received the same visions if not taken on journeys to witness and see the same thing many years passed. What you hear is only a small portion of what is heard all across the land and around the world each second. We hear millions upon millions of tearful prayers from those who experience, hopeless despair. Truth is painful for hearts: but cries have grown stronger for the first time in a number of years, an abnormal number sense there is nothing . . . but death left for them. Tears are flowing stronger and longer with the increase in cries of despair grow louder! We hear hearts wondering where they may find the real spirit of living life let alone [Spirituality of Christmas]. Excluding the hearts of many who have given up, because they say the darkness has gotten too strong, for them to deal with. Now let the prayers provide strength of awareness during this season people should be gathering in numbers to pray for the spiritual wisdom to awaken the light of life, but instead they hide their faces and hearts. What are the Truths the Ancients Knew the Secret Codes? It is important to remember and walk a spiritual path for many reasons, which say nothing should begin before blessing the land; this means ones need to start with spiritual preparations of personas, and land prior to planting crops. The purification of self and those planting and harvesting crops are equally important. Honoring and purification ceremonies help increase the nourishment and quality of crops. Grandmother M taught me to bless the land with herbs and corn meal, combined with ceremony drumming, singing, prayers and blessings, prior to and during ones harvest. This I also do before I start the food preparation and cooking, since this is a time to begin the Giving Ceremony of Universal Thanks. “Yes, this is the sacred season, I have always cherished, for its gift of increase awareness and awakenings . . . . Once the blessings are completed its time for ones leap of faith. A time of that begins with spoken one-way conversations with the Sacred Ones, which includes Sacred Father, et al. Yes, offerings, sharing and conversations can do throughout ones seasonal Giving of Personal and Universal Thanks, once preparations, and offering of gifts, are done one-day a week. Offerings are wonderful times of thanks, along with a time to honor and show respect for guidance, lessons and guardians, Sacred Ones provided. Then I always offer prayers for world blessings, but this time it was more urgent and heartbreaking. Seeing as how, this season was of greater importance than a good portion of life cycles and seasons prior to November 2001: Now I found myself expressing a strong inner-hope for answers and direction with this year conversations. The pain and shock around the world has proven too great. Countless hearts of people and spirits around the world are raw with pain, mine felt as raw if not greater, than most of the nation’s pain after the events of 9/11. My raw pain questioned why I could not get people to listen; maybe the deaths would not have happened or lessened, to some degree? Yes, my pain cried out in agony more than most, who were not directly involved. For almost a year prior, I received numerous messages and warnings showing the violence and death to come, but it seems I failed; I had not been able to reach out and get people to listen. My heart hurts because I failed to get enough people that mattered to listen, and not able to make contact. I feel I did not work hard enough, and the government agents I spoke with wrote me off, failed to listen, and did not care enough, thus everyone with the connection failed to any take action. I contacted over a hundred different departments, including churches, newspapers, and government agencies. Sacred Father, truth, was there something else I could have done? Knowing the Devil, and knowing he is now the one driving this war, I wonder what must be done to bypass him. The time is his and he introduced to the world his three-headed-serpent, who is programmed by the and the puppet to the Red-seven-headed-serpent of evil, (Satan’s Demonic Dog of Evil) and all the rest whom he will soon gather together. Due to this and because of what is ahead of humanity, my sprit knew it was time to have important—heart-felt, comprehensive conversations: from my mouth to the EARS of the Sacred Father, Great Spirit, Archangels, Grandfathers and Grandmothers, ancients, ancestors and relations. The first day about two hours into this season’s preparation/cooking conversation opens up after I set out the first five pieces of fry-bread, in the way Grandmother M taught me to set out, to feed the spirits. Then I could continue, with the communications, and set five more out with each new batch or fry-bread and cookies, I baked to give out to friends and others I did not know. passionate/concerns. . . . Grandfather’s, why and where has this new compassion come from? Honestly Sacred Father, looking back over the past 18 months or so, it all started with the arrival of Archangel Michael’s messengers and the introduction to the Devil’s intervention September of 2000. The one who warned me 9/11 was coming long before 9/11. Why the impression of heaven rumbling or trembling in sorrow when Bush was elected President? First I thought the trembling my imagination, only to learn the election staged in away, which gave greater power to the Devil. “Is that why so many government, agency, and military personnel who knew the truths were assassinated, files purged and/or destroyed. In fact, all my research suggests all records, of entire units files purged from the Pentagon Files. I know all the records kept regarding Iceman, Stoneman, and Shadow, the Feds received orders to found and destroy, before the 2000 elections, the year is became Cheney/Bush election? Is that why you said it should have never been? What are the secrets you have not revealed, which ones have you spoken with? Another thing when I spoke out as you instructed, no one wanted to listen, well I can’t say no one listened the Secret Service personnel thought me a terrorist. After many hours of integration, they still refused to take any action beyond investigate me, and all who knew me. The lazy by the computer agencies and government had been getting hints of danger, and they were aware of people who were ready to strike from many directions, yet they were to lazy to care. Many people warned them not just me; and yet, they refused to listen or is it possible they received instruction, to turn a blind-eye and listen not? Finally, when it came down to the Secret Service writing up their assumptions in reports, most assumed, I know declared . . . Red Sun is a crazy extremist or a terrorist. Three times I knocked as instructed in an attempt to get people in authority to listen. Each time I explained your message, the churches and agencies pushed back harder. Questions were they afraid to accept that which the Sacred Father, revealed and could not accept the warnings, which might have helped such massive areas of destruction? Tell me truth; it is hard for people to believe, until it is too late, since the day the Dark Avenging Messenger Angel delivers his messages of violence. In less than twenty-four hours terrorism began in earnest, worldwide changes, violence, suppression, varying types of terrorism, lose, separation and war. Even knowing this as truth, some part of me wants either disbelieve or believe its only surreal. Maybe that is how those I spoke with felt about me, too? None of the warnings can be suppressed now, since one and all are caught-up in the hate and anger of darkness, period. “Excuse me, but I first needed to vent my concerns. Now I truly wonder, if anyone has or will in time listen, would events and things been different or just delayed? During the years, SunHawk, Shadow and others worked covert ops: many terrorist attacks were stopped, because people took serious the information given them. They investigated and followed up leads. Nowadays most sit behind computers, refuse to listen and take long lunch breaks. ‘We have no confirmation from terrorist, so until we do, what you say isn’t true.’ I began to wonder if they were hoping for invasion or just easier for them to deny and declare words as untruths, so they could sit back and read comic books, play computer games and take week-long lunches. “However, real concerns surface now, after current conditions activation and realization of such serious facts . . . is how . . . . How can; we [the people of the universe] tap into it . . . the Sacred Spirit of Life Eternal Blessings a.k.a. the reality of heavens truth, the coded message within the true Spirit of the first true events we call the Christmas a.k.a. The Sacred Gift of Eternal Love and Light by He Who is the Light. Has not the time come for us to understand within all this chaos to find the truth, to the questions many seek? Where do we find it? Then too I question: If we can find it will it help open a way for us to find peace? Sacred Father, when I look around, numerous parents and children cry, because of separation and/or loss of family members. Life will never be the same for anyone. This pain my heart understands, all too well, as you already know. Thanks to life lessons, you walked me through. Surviving spouses and families feel loneliness, some stop feeling all together, while others don’t want to go on living, themselves. After loss many exist in a state of detachment for a time, watching the days go by on one level, while seeking revenge on another. No one can be prepared for such life changing events, a time when the lives of survivors, take on varying degrees of surrealist dimension, without warning. Sacred Ones and Elders, look around, at all who have lost one or more family members, friends, neighbors and co-workers, not just through violence but illness, as well. All of these losses are awakened within a vast population, which have reopened wounds of losses, thus all losses are taken more personally than at any other time, since Vietnam. Strange, how conditions, planned or not, failed until now when this and a series of attack awaken a new reality, for only now, are we awaken with the capacity to accept and understand how people of other nations have and are affected by such losses, past and present. In truth, nerves are raw, because of and nations around the world although suffering now, will soon be suffering more than normal: Everywhere one goes, one cannot help but witness the magnification of anguish on every face. What’s the reason we need to know and experience? Events of 9/11 has proven to be a time of compassion in spite of . . . whatever emotional and financial state a person’s life is in . . . their environment matters not . . . because of the deaths, destruction, and invasion. From around the world countless people want to do something to help those whose suffering is fresher than their own. Sacred Father, you know better than anyone, many wish in their hearts, they could help, but lack the ability to do so. When they can’t their heart=s feel guilty, as you see and know far greater than I, this guilt eats at them, for any number of reasons. What can be done that has such spiritual power and support? Truth of reality, for many it is all they can do to keep a roof over their families head, let alone feed and/or gather clothes to keep their family from running around naked. Notwithstanding, you know better than I, for many hunger is a daily way of life for countless of thousands across every continent. Still, among these numbers the desire to help is not diminished, if they have not a roof of any type over their heads or a place to call their own, because of any number current problems or world conditions. Questions, Sacred Father. . . Yes, many questions? had in mind for us to understand? It is suggested the Spirit of Christmas is within us, but where is it? personally awaken it in us? What is the coded message, if in truth, did it get lost so long ago? What truth and facts of are we missing? What truths have we failed to interpret that’s in our face? adventures which will in time answer many of your questions and leaves the conclusion up to you . This journey began because I realized the sacred truths have been hidden and denied, most of humanity. Now it is time to speak with the Sacred Ones and learn the truths from them. 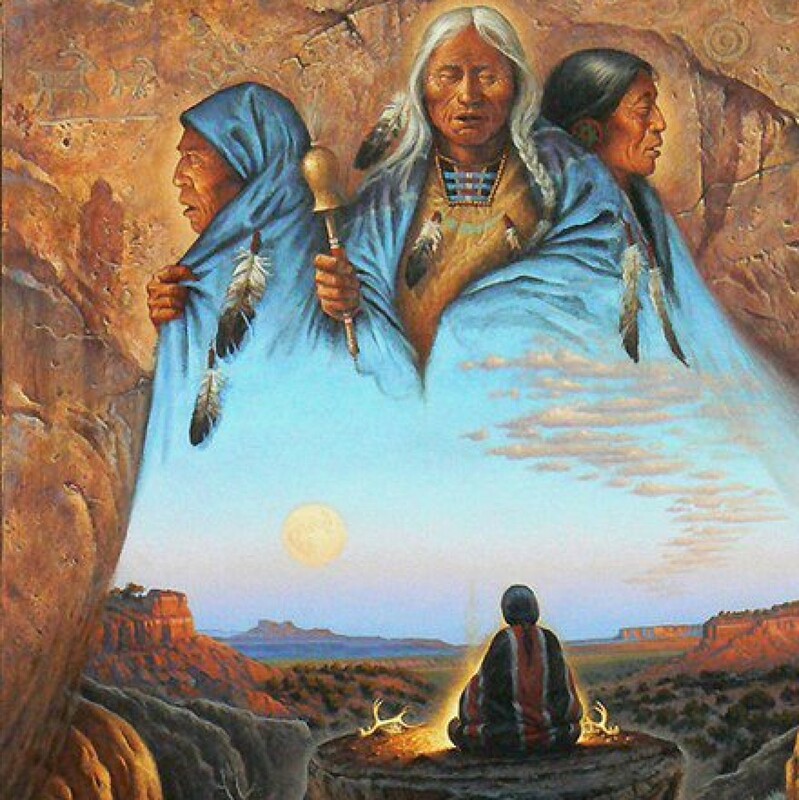 It is important to learn and understand what Sacred Elders and Ancients knew for centuries. We have had so much in front of us for so long, yet we fail to see. Honoring life and traditions starts in sacred ways [November 1 and continued with various ceremonies and celebrations until the morning of January 3], since this was a time for spiritual development and sacred spiritual communications. The first ceremony begins with blessing the land around ones property and home with sacred medicines, tobacco ties, along with putting out food for the animals and Sacred Ones. The blessing ones home with sage, cedar, and tobacco, sweet grass. The second is cooking foods to share with elders, family, friends, and others. During this time is when one asks the Sacred Ones questions after inviting them to share in the offering and offer thanks for all the guidance and blessings one has received through the year. We do this for a number of reasons, before one begins it is important to purify land and home, for the Sacred Ones, Relations, and Sacred Elders to accept invitation to come and visit. Seasonal cycles with a day many commonly refer to by the term Thanksgiving, a time of thanks that seems to fall over a cliff, and does not go beyond the feel good day. The ancients realized the spiritual values to this sacred cycle of universal rebirth, which increases our eternal connection. The seasonal gifts and teachings, offers individuals the ability to understand far more than one can express, a gathering to say or express thanks. Each a grand cycle of Giving Personal and Universal Thanks, which can awaken one to grand enlightenment opportunities and experiences of Sacred Spiritual Communications, and Spiritual Growth. Each season is a time to honor and show inner-personal respect to Ancients Elders, Sacred Ones, and Universal Guardians; along with ones guardians, relations, and all our ancestors. A season for traditional ceremonies and celebrations the Sacred Ones taught Medicine Elders, who taught Grandmother M, and when the time was right, indirectly they who honored me with sacred blessings, to learn and become one with the Sacred Season for giving personal and universal thanks. on to me from one scared grandmother, Grandmother M, came from what she learned from the elders and the Sacred Ones. Heart and Spirit Reviews: the decades, after Grandmother M crossed, and trying to honor her in sacred ways, proved more than a sacred journey, it became a lifetime of learning and education. However, she gave me the foundation to receive the gifts of spiritual enlightenment and wisdom. For more than sixty years, the foundation of enlightenment and gifts of spiritual wisdom, the physics of miracles, amazing journeys, sacred awakenings, and effects gained via awareness, and influences of these seasonal cycles, she left Red Sun to discover sacred truths and inner-spiritual/universal connections. The sacred truths within the season of our traditional/spiritual interaction and knowledge, is part of the sacred journey left for the women to conduct in sacred ways with truth and honor. Between visions and events they left me with many questions, which I can say, proved about the same number of seasons in exploration to discover the various ways one might receive acceptance and permission to receive greater spiritual experiences. It is important to cleanse and purify, ones total beginning, develop personal spiritual growth, and sacred understanding. Truth, the Sacred Ones do not accept or teach one until one has shown a true heart of honorable love, which honors the Ancient gifts, with sincerity of spirit-heart. inspiration. Soon one learns to connect with oneness, how to share in the scared ways filled with spiritual love thus allowing one to communicate with the Sacred Ones, easily. Yes, I can remember, what it took before the Sacred Ones entrusted me to receive sacred visions and visitations. The flowing year, you instructed me how to do the honoring ceremonies and celebrations, and again it was time to follow the sacred instructions, without question. Once the Sacred Father, the Sacred Ones trusted Red Sun, they began with more training filled with numerous instructions and more involved lessons. They also demanded and expected more and more between each cycle of Giving Universal Thanks; and during each seasonal cycle. The beauty of giving is so much more than just offering food or clothing, but it means to give in spiritual love of oneself in time and energy, helping to make the life of others a little more joyous, thus one in blessed ways through energy provides and gives forth sacred spiritual blessings, which carry enlightenment. The light we share is a wonderful gift in many ways and the one real blessing of thanks, which is universal and can make a difference. Honest thanks, equals spiritual gratitude any season or cycle enriches one infinite spiritual communications, telepathic conversations, and universal connections. One sacred bonus all cherish: Traditions during these ceremonies allows for one to begin countless one-way conversations and some of these conversations receive answers, when least expected. Once gentle communications coupled with visions occurs, euphoria lets individuals know guardians and relations honor them. The same day or maybe several days after asking questions via one-way communications; one might begin to experience spiritual connections and communications. Remember, it is important to feed the elders and scared ones, sacred children, Mother Earth, along with those, ones senses suggest. Then ones spirit feels lighter and brighter, and the window is open for communications from the Highest of the most High, Sacred Elders, Ancient Elders, ancestors, relations and guardians. In truth, all who have experienced such communications, One can never can be sure who or how many will come to answer questions or decided to introduce new wisdom while answering other questions one might have put on their shelve of sacred unique universal questions years earlier or combine numerous answers, during said visit or spiritual journey or receive visitations from relations to resolve some matter. On the other hand, one or more of us might be asking certain questions, which the Sacred Ones for any number of reasons decided not to answer until the right season or you are more spiritual advanced. Medicine Elders and others who follow the sacred seasons of Giving Universal Thanks, across time discovered before they received answer, certain questions or floating answers require a series of compound questions and floating answers, in addition another decade for things to come together. Honestly, many things must transpire before one receives spiritual visions, visitations, and universal experiences. One can receive many answers, but if not ready for the gifts and answers, it is only similar to feeding hogs pearls and diamonds, no one benefits. We need the background and knowledge to appreciate and learn from the gifts of discovery and wisdom. The pig cannot witness and comprehend the reasons for the questions, ones journey, on concepts behind the questions and answers. Spiritual advancement and development is a wonderful journey filled with experiences, designed to help us learn in very unique ways. Stranger how countless family and friends might have researched and sought answers to some of the same questions floating around for several decade and they receive nothing, until one asks the bulls-eye question. Then and not before the compound series of questions are asked, preliminary spiritual journeys completed and personal spiritual knowledge obtained, and capable of comprehension and analysis of universal knowledge, before quantum surprises. The spiritual veil the Sacred Ones approve certain teachers to open the veil and take those approved on uniquely wonderful journeys where one can experience, observe, interact, and absorb sacred knowledge, in sacred unique ways. Spiritual Facts are stranger than our everyday reality: with one receives unique answers and adventures to a series of questions, new questions arise and answers to unasked questions, leaves one with a series of floating mental question marks, too, seeking the position and/or home while trying to discover their journeys. Then who can say if the answers are to questions what questions are to answers. Then answers are question asked and you have not yet discovered, or is it possible for s series of questions to suddenly become both answers and questions in some unexpected way. Now who can say, who it is that hold your answers or you whose answers of enlightenment you hold? Yet, in some unexpected way you and this person were meant for you to meet, if only to exchange answers, prayers, questions or be the messenger of enlightenment need. In truth, it has been my experience when one asks important, which require unique questions one might not receive acknowledgement for a number of years, or until not a few, but many are ready for the answer. Our family traditions began with lessons taught by Spiritual Medicine Elders who were old when my Grandmother M was young, which they learned from elders that were old when they, too, were young. Yes, in truth, they taught her to use and share many sacred gifts of medicine and wisdom. These same teachings, Grandmother M shared every opportunity possible the spiritual knowledge and path of sacred medicine knowledge, thus it required crossing rivers, spirit walks, and intense training. Who would believe planting crops, caring for, harvesting and share, could provide one with so many lessons of spiritual enlightenment. Since we were not on a farm or reservations, she persuaded neighbors to plant neighborhood gardens. After our harvests, of corn, squashes, pumpkins, tomatoes, apples, and potatoes, we seem to have a range of vegetables, fruits, nuts and berries, many, many baskets full, which were welcome gifts. Grandmother M knew many farmers, who donated food, other that had too much, left baskets full left by our doors. Inside and out, sharing made it very interesting getting around the kitchen and our cellar, since for a time each season our home appeared stacked full, but the food never went to waste. Some years our front room and dining room, became hard to walk through. . . . Where do we eat? Nevertheless, before we could share the food we needed to bless all, sent out spiritual invitations and offerings. Grandmother M said the offering of is very important, It was a time to bless all the food with corn meal, smudge with sage, and herbs, and then give thanks via drumming, songs, and prayers. Only after the sacred blessing ceremonies and prayers, we shared by giving some of the crops back to feed Mother Earth, to honor her, can be a very powerful gift, since she will help honor others with good crops the next season. It is important purification of land, done each day so the sacred spirits feel welcome and bless all who come to the property. Grandmother M taught me about tobacco ties, prayers and why we needed to place them in the trees and bushes around the property. Next, it was time to see which nature’s children would be our guest until early to mid-spring, because we had to ensure we had food for them, also. Three days of ceremonies, which included more drumming and singing to summons and feed the sacred spirits, relations, ancestors and guardian. Food is much more sacred than most people realize and if treated and blessed in a good way, it can feed not only the mind, but the body and spirit, too. All the food gathered needs blessings to help heal not only one hunger, but ones spirit, mind, and body. Blessed food seemed to feed twice the number of people, food not blessed feed. Not blessed feeds five and blessed feeds twelve with food left over. Great Spirit, this is a season many need a warm place to sleep and food in their stomachs. The season to feed all who comes to our homes, give food baskets to those in need and/or gift friends food that are important pieces of your family’s life, even if it is a plate of cookies. Food prayed over in a sacred way becomes more than just another meal or snack; it is nourishment for individuals total physical and spiritual being. Food is life that can give strength and renewal of eternal life and enlightenment, as well. However, this day before food can be passed out, to family and friends the first five pieces of all things prepared plus harvest goods, need to be put out for the Sacred Father and sacred guardians that have helped to insure a wonderful bounty.